Intelligent Channel Select: Highlight/Select a channel in WinDaq and invoke WinDaq->View->Add-ons->Magic Meter, and it will use the selected channel as its default channel (see video demo above) when it is not in calculated channel mode. Move the mouse to the left edge of the display to reveal the configuration button. To use the data-window derived results, use #freq , #min, #max, #ave, #rms and #acrms to represent Frequency, Minimum, Maximum, Average, RMS, RMS without DC component, i.e, #acrms0 take the AC_RMS of channel 0. Please select the window size carefully. To use this feature, you should start the add-on from the SAME WinDaq logical channel. For example, highlight the second channel on WinDaq, start the add-on, set up the add-on then exit. Now the configuration is saved in a configuration file associated with second channel. You can have multiple configurations for the same device, each configuration associated with a different WinDaq logical channel. To recall the configuration stored associated with logical channel 2, highlight the channel on WinDaq, start the add-on. The logical channel mentioned above is not the physical channel, it is the logical order of a physical channel listed in the channel selection box. For example, we have two WinDaq setups, one with physical channel 1,2,3,4,6,8, and the another with physical channel 6,7,9,10,14,15. If the add-on configuration is associated with the second logical channel, then highlighting physical channel 2 from the first setup then start the addon will be the same as highlighting physical channel 7 then start the addon. 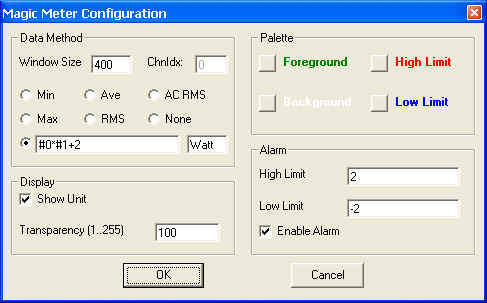 Fully programmable palette for better visual effect when superimposing magic meter to Windaq. Although the meter appears to embed inside WinDaq, it is NOT. When you move WinDaq's window around or add/subtract channels, it will NOT follow your action.